Cakes are always a problem for vegetarians. Most of them do contain eggs or egg derivaties. This recipe will surely turn out great without using any egg. Sift flour, baking powder, baking soda, and sugar together 2 to 3 times. Keep aside. Mix condensed milk in a bowl with butter and beat well till it turns smooth. Add flour one spoon at a time. Add some milk as and when butter begins to get too stiff. Be careful to stir the mixture in one direction only. 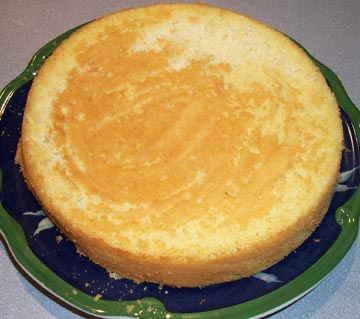 This incorporates more air and makes the cake fluffier. Once all the flour is used up, beat the batter as above till it turns light (5-7 minutes). Add soda and mix gently till smooth. Pour this mixture into a greased cake tin and place in a pre-heated oven (300 c). Reduce the temperature to 200 c for 5-7 minutes and 150o c till the cake is done. Check for doneness using a skewer. Remove and cool it on a wire rack. where do i get replies for al these queries posted above ?? Nice Recipe . Thank U .
i had tried this recipe bt the cake baked was not soft. i would lyk to know how can it be made soft. HI, THE OVEN WHICH I HAVE SHOWS TEMPERATURE IN NO LIKE 1, 2, SO ON UPTO NO 9. GAS NO 9 IS EQUAL TO 240 CENTIGRADES ADN THAT IS THE MAXIMUM. SO ON WHICH NUMBER SHOULD I PRE HEAT THE OVEN AND FOR HOW LONG. Divya i think u can use powder milk/dry milk instead of condense milk. can we use something else istead of condense milk? can i make this cake in microwave oven at same temperature? hey , hw cn u bake a cake this qty. for 5 -7 mins. ? i htnk u hv made a mistake. Please advise what powdered sugar is, is it different from castor and icing sugar? If I want to make at least 5 cakes in one mix how can I increase the ingredients accordingly. Please advise what powdered sugar is, is it different from castor and icing sugar? recipie is good but i don't have oven then can i bake it in the cooker .if it is possinle pl. send me the method how i can cook it . You have mentioned 100 ml soda water in the ingredients , but no where used in preparation .so is that misprinted or is it ingredient? hi, i find this good, but i would like to know how to cook in cooker. if you have anything such that then please send me some more cakes which can be baked with cooker. thanks yaaaaa. I would like to know how to bake the cake if one dosent have oven. In the recipe you have mentioned about vanilla extract but when to put it is not stated,also how much to put baking powder was not mentioned so the cake I prepared was not that good and fluffy.Can you please give the exact measure of the cups mentioned in the recipe so that next time the cake prepared can be good. Reproduction of the contents of this website without permission, in whole or in part is prohibited.